I wonder how many veins the Wolf had to cut to get this treaure put onto paper? You know the old saying. Writing is easy. all you have to do is open a vein. . .
We all got those skeletons in our closets. We get good at hiding them. But when weexpose themto the light of day, it helps others to understand, to cope better, to realize that their mother-humpin’ life ain’t so crazy after all. It is, but, so is everyone elses. It’s funny you put it that way. I started this about three times before finally settling into it. And before that I’d gone three years wanting to write this, and not knowing where to begin. 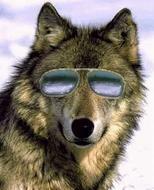 Often people would ask me “why wolfshades?” , and I couldn’t answer them. I could say that the wolf is my totem but that’s too flat, and doesn’t portray the power of the thing. The Beast is long dead of course, but the effects of his existence live on, not just in me. Obviously heart-felt, you have a talent for expressing what is happening inside you that I wish I could come close to. Keep it up, I love reading this stuff. Once again, this one got away on me and in the end it was just a matter of going with the flow. I really prefer not looking backward at all, really. So I suppose this will serve as a kind of introduction of some sort. Thank you for your comment and encouragement! It means a lot. I cried when I read this. Beautiful. I ditto many comments before mine….but really, this was well-written. A reader can’t help but be engrossed in your words and be moved by them as well. Thanks for sharing…obviously it was personal, but definitely heartfelt. Thank you very much! I appreciate your thoughts on it – you never know, when writing something like this, how it will be viewed, so it’s gratifying to read what you and others hear have said about it. Wolf. This was one of the best posts I have read. Really excellent. …and you know it’s a good blog when you can’t stop thinking about it…I was just thinking about this same type of subject today and considering writing about it (considering for the umpteenth time) before tossing it away as too “uncomfortable” to explore. Kudos to you, man. Thanks Abe – and I know what you mean. The material, the thoughts and the complicated feelings are all there – the rough part is figuring out a way to present it in a way that others will understand. Add to that the fact that you know full well that others may see it all in a way in which you never intended. Like the last blog, I had no intention of going here – even though it was obviously bubbling in my subconscious, waiting like steam to escape. The intent was to discuss my…totem (for lack of a better word) of the wolf and it wasn’t until I got into it that the back story made its appearance. It’s a little disconcerting but at the end, the story was presented in a far more satisfactory way than I’d first envisioned. Love the blog – very reflective and from the heart. Frightening how life deals out different cards to each of us and for a while we’re stuck with our hand. There always comes that point though when we have the choice to change events, hopefully for the better. It’s a leap, but in my experience it usually pays off. I surely did, I think. One of my sisters and I talked about this last night. The odds, for children who grow up in abusive environments are not good, as so many tend to replicate their experience. To them, that dysfunctional behaviour feels “normal” to them. Often a boy will look at his violent father and (maybe this is a Stockholm Syndrome thing) seek to emulate him in order to receive approval. I don’t know why that didn’t happen to me. Ultimately though, it’s a choice isn’t it? Our parents can only accept limited blame or praise for how we turn out. Individually, we are responsible for our choices. The unaware are more at risk, probably, than those who are completely self-aware and cognizant of their behaviours and the reasons for them. However vicious, the wolf persona that emerged from such? He’s an exceptional man. Touching and distrurbing until I realize the outcome. If you were a dog, I’d bring you home. Funny thing: the wolf can certainly be vicious when he’s protecting himself or his pack, certainly. Unlike the Hollywood caricature of the wolf, he doesn’t tend to pray on humans; and he never hunts for sport or pleasure. I know some dog-wolf mix breeds can be domesticated by generally it’s not encouraged: he prefers wide open spaces. Thanks for coming over and for commenting! Interesting and so well written! Good on you.